All the BNs were assembled in the starting point at Nandi Toyota showroom. No delay in reporting there. Thats the passion to ride. Dr. Prithvi took the attendance, all present 9 riders and a pillion. 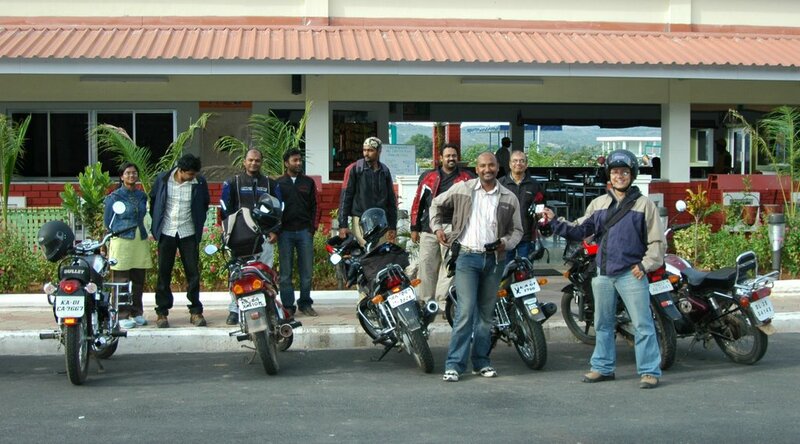 The plan was to ride to Reliance A1 plaza, which is just after Hosur, have breakfast and take a call on what to do next. 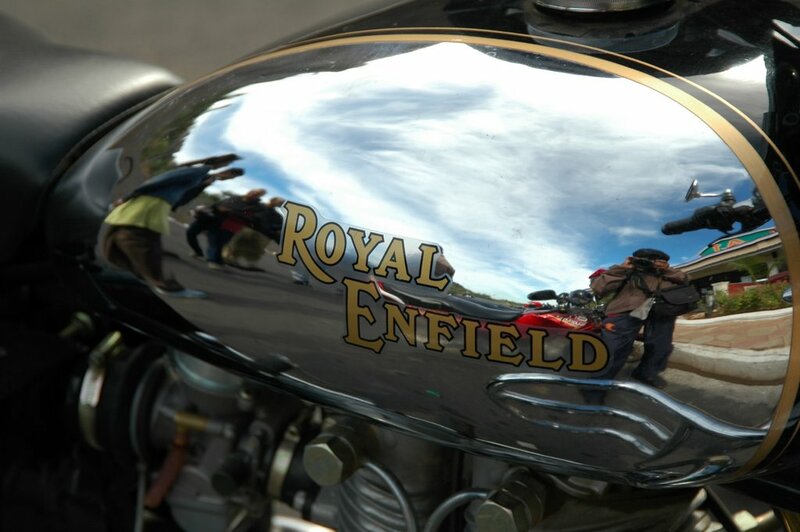 We started exactly by 0700 and it was fun to ride in group. My first ride in such a big group (previous one was a group of 4). I could see the headlights switched on of all the BNs in RVM. 45 minutes flat we were at A1 plaza. Breakafast comprised of Dosa, Pongal, Vada, Omlet, Coffee. Talk during the breakfast was just bikes, bikes and more on bike rides (Leh, Goa meet). Post breakfast, Rajkumar returned as he had work in Bangalore. 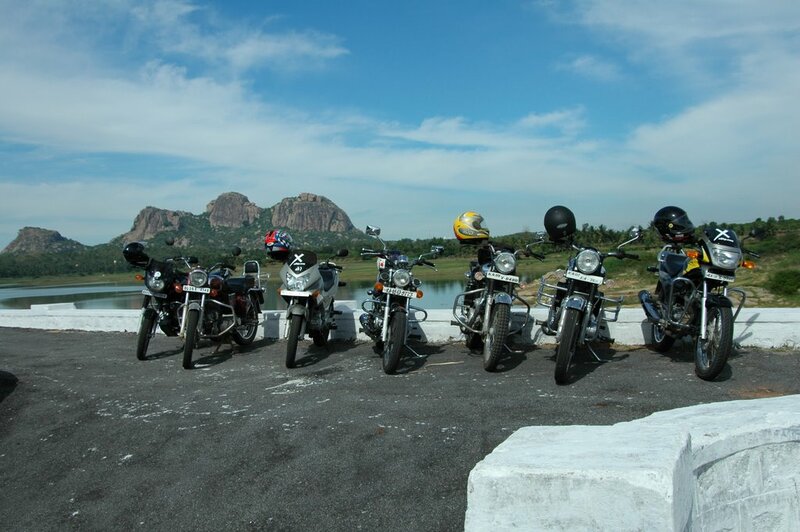 Rest 8 bikes proceeded towards Krishnagiri. At the deviation point to Shoolagiri, Mr. & Mrs. Prabul bid farewell as they had a family function to attend. From then onwards Dr. Prithvi led the way to Shoolagiri dam. Name Shoolagiri is after the hill which is in the shape of trishool (weapon of Lord Shiva). After Shoolagiri village, its a narrow road full of small twisties. Only audible sound during the stretch of 5-6 KMs was JSR’s thumper. We spent more than half an hour there. First few minutes spent in clickin photos and then ttalk, talk and talk. Most of the discussion was related to bikes and Leh ride experiences from Prithvi and JSR. Started back with plan of stopping over at Tamilnadu hotel just before Hosur, as its very easy to get lost in mad traffic. But still Kamlesh and Vasanth got lost. Rest 5 had coffee at the restaurant and proceeded towards Karnataka-TN border where those two were waiting for us. Stopped at the border, said ok-tata-bye-bye to each others. And rode back home with a promise to ride together in coming days. By the time I reached home, trip meter was showing 151 KMs. Prashanth have been to Leh or are you planning to go sometime? Did you get the information about this place in Deccan Herald? I was just wondering how you got to know about this place.